A premium refrigerator doesn’t have to break the bank. If you are looking for a spacious and modern refrigerator that is built to last, consider the Samsung RF28JBEDBSG refrigerator. This French door refrigerator has plenty of features to love. Use this review to see if it is the right refrigerator for you. To better understand this refrigerator, we compare it to other premium models offered by highly rated brands. What Is the RF28JBEDBSG Refrigerator? There are plenty of features to consider when looking for a modern refrigerator. You should choose a refrigerator that not only keeps your food cold, but also becomes a centerpiece for your highly refined kitchen. Consider the most important aspects of your new refrigerator and use this guide to help identify some of the most common innovations in the latest refrigerators, such as the Samsung RF28JBEDBSG. What Is the Samsung RF28JBEDBSG Refrigerator? The RF28JBEDBSG is a premium French door refrigerator that offers plenty of cubic feet at a great price. While it’s far from a budget model, the refrigerator costs far less than many other Samsung refrigerators. It has four doors with sturdy, adjustable shelves for plenty of groceries. This refrigerator also includes a dual-door on one side, so you can get to small items easily. You won’t find anything shocking or completely innovative about this refrigerator. When compared to smart refrigerators with Wi-Fi capabilities, built-in coffee brewing systems and other recent trends, this refrigerator includes only a few features that set it apart from a basic, entry-level refrigerator. What it does well, however, is provide excellent build quality, a durable exterior and a spacious interior for the ultimate combination of functionality and affordability. The popular Korean tech company, Samsung, began as an appliance company before offering more well-known products, including smartphones and laptops. Samsung appliances are generally well-rated and reliable. Although many technicians report that Samsung products are difficult to repair, customers encounter fewer problems with Samsung appliances than many other, less expensive brands. There are a wide range of Samsung refrigerators available, ranging from high-end to budget models. If the Samsung RF28JBEDBSG is too expensive or lacks some innovative features you are looking for, consider another model by this highly rated brand. Refrigerators are advertised based on the interior cubic feet of storage space. This number is often rounded, so a 22.2-cubic foot refrigerator will be listed as a 22-cubic foot refrigerator. This number combines both the refrigerated and frozen compartments. Since most refrigerators are between 9 and 30 cubic feet, this Samsung refrigerator is large enough for any family. However, don’t rely only on cubic feet to determine whether a refrigerator is the right size for you. Check the exterior dimensions to ensure your new refrigerator will fit in your kitchen. Compare the shelving options for each refrigerator. Some refrigerator models include plenty of adjustable shelves, while others have a few compartment-wide shelves that are less flexible. Consider models, like the Samsung RF28JBEDBSG, that use a compact ice maker design to maximize the cubic feet. French door refrigerators are currently the most popular option for your kitchen. This style combines the convenience of a bottom-freezer refrigerator with the dual-door look of a side-by-side refrigerator. It’s a great option for quick access to refrigerated items, and a pull-out freezer door allows you to access both compartments from either side. High-end refrigerators add a fourth door for even more storage possibilities. The Samsung RF28JBEDBSG not only has French doors for the refrigerator compartment and a pull-out door for the freezer, but it also has a pull-out drawer that is refrigerated with independent temperature controls. It’s perfect for drinks and other easy-access items that need to be cooler than your fruits and vegetables. A great reason to choose a French door or side-by-side refrigerator is a water and ice dispenser. These convenient additions make it easy to have on-demand cold and filtered water. Basic models only allow you to choose water or ice, while high-end dispensers feature programmable amounts of water, cubed or crushed ice and an easy-to-read display. Most customers prefer a refrigerator with a water and ice dispenser. When selecting a refrigerator with a dispenser, make sure the appliance uses a compact ice maker. Smaller ice makers take up less storage space in your refrigerator, which gives you more useable cubic feet of storage space. Enjoy the convenience of a large water and ice dispenser with the Samsung RF28JBEDBSG. The digital display is easy to use and offers plenty of ice. The built-in ice maker can store up to 4.2 pounds of ice and produces 10 pounds per day. However, it isn’t as compact as other refrigerator ice makers. To keep both the refrigerator and freezer cool and humid, this model has two evaporators. You can see every corner of your refrigerator easily with the LED lighting, which is also energy-efficient. We suggest choosing a refrigerator that is durable and scratch-resistant. While refrigerators with a smooth surface give your kitchen a more traditional look, many homeowners are choosing stainless steel or black stainless steel for a durable and stylish alternative. Stainless steel appliances instantly give your kitchen a more modern feel, and they match almost any color scheme. While not as common, black stainless steel has all the same advantages with a twist. Add a touch of elegance and mystery to your kitchen with this unique exterior. The Samsung RF28JBEDBSG has a black stainless steel exterior that is fingerprint resistant, making it perfect for families with small children or pets. Most budget refrigerators use a single evaporator and compressor to cool the entire unit. Not only does this lead to imprecise temperatures in the refrigerator and freezer section, but it also doesn’t precisely control the moisture level. By splitting the system with two evaporators, premium refrigerators such as the Samsung RF28JBEDBSG offer precise humidity and temperature controls throughout the refrigerator. If you want to keep your vegetables crisp while preventing ice build-up in the freezer, consider choosing a refrigerator with dual evaporators. The latest trend in high-tech refrigerators is the emergence of smart refrigerators. These premium models boast Wi-Fi connectivity, which allows you to track important data using your smart device. Use your phone to monitor the life of air and water filters, adjust the temperature and get other important up-to-date info. Some customers love the instant access this feature gives them, while other customers feel it isn’t a useful addition. You must explore some more expensive Samsung refrigerators or other competitors on this list if you are looking for a smart refrigerator. The Samsung RF28JBEDBSG does not offer any of these smart features. Overall, the Samsung warranty is rated highly. The 10-year warranty on the compressor is one of the best in the industry. Many competitors only include a one-year warranty on all parts and labor. Like most warranties, be sure you register your refrigerator and install it following all the instructions in the owner’s manual. For its size and price range, this refrigerator performs very well in independent tests of energy savings and storage capacity. Reviewers love the price tag and energy efficiency of this model. However, they found the dual-door to be impractical and the ice maker to be less compact than competitors. Overall, it is a great choice for a straightforward refrigerator with a large interior and great energy efficiency. Customers like the price tag and durability of this premium refrigerator. Most customers feel it is quiet for its size, and that the ice maker is efficient. However, many customers feel it doesn’t have as many features as other high-end refrigerators. Only a few customers have issues with the ice maker working properly. The RF28JBEDBSG is a mid-range refrigerator by Samsung in terms of pricing, but it has plenty of premium options. Most French door refrigerators are more expensive than side-by-side, top-freezer or bottom-freezer options, and this unit is no exception. While some refrigerators can cost as little as $500, most French door refrigerators start at $1,000. You can easily spend up to $5,000 on a high-end refrigerator, which makes the Samsung RF28JBEDBSG a competitively priced model for its size and features. Large appliances, like refrigerators, are often sold at discount prices during holidays and other major events, so check in stores and online at these times for savings. Most department stores and online stores offer free shipping and installation. To ensure correct installation, make sure you receive these with your new refrigerator. 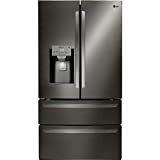 While this GE French door refrigerator is more expensive than the Samsung RF28JBEDBSG, it offers some of the most unique upgrades. This 22.2 cubic foot French door refrigerator is a smart refrigerator, has plenty of adjustable shelves and a Keurig K-cup system built-in. The water dispenser is programmable, so you can measure exact amounts of water for your glass or for cooking your favorite recipe. Because of the innovative Keurig brewing system, you can have instant access to your favorite coffee or tea, or also hot water for preparing food. Of course, this refrigerator is smaller than the Samsung RF28JBEDBSG, so it isn’t as convenient for large families. Consider this refrigerator if you want the latest technology and premium features in a mid-sized refrigerator. Meet the perfect choice for storage capacity. The Whirlpool WRV976FDEM offers plenty of storage options packed into a 26 cubic foot refrigerator. Not only does this stylish refrigerator offer two separate drawers on the exterior, it also uses a thinner shelving design to give you 25 percent more space. It doesn’t have the same premium features as the GE French door refrigerator, like smart capabilities and a Keurig brewing system, but it does offer a compact ice maker, a programmable water dispenser and sliding storage bins in the freezer. However, this refrigerator is the most expensive option, and is significantly more than the Samsung RF28JBEDBSG. Choose this refrigerator if you want the best in storage space with a smaller footprint. A great combination of affordability, spacious interior and the latest technology, the LG LMXS28626S is a great option if you want an affordable smart refrigerator. This refrigerator is capable of connecting to your device via Wi-Fi, which allows you to monitor the filters, temperature controls and other important data. Choose between stainless steel or black stainless steel material for a stylish centerpiece. It includes a water and ice dispenser and excellent air and water filters. The dispenser isn’t programmable, so it isn’t as convenient for cooking as the GE or Whirlpool options. This refrigerator does not have as long a warranty as the Samsung refrigerator, particularly on refrigeration parts and the compressor. This unit offers great warranty and it's also very affordable for its size. However, the built-in ice maker is not always reliable.